Hello friends, today we are talking about blockng of google adsense account. 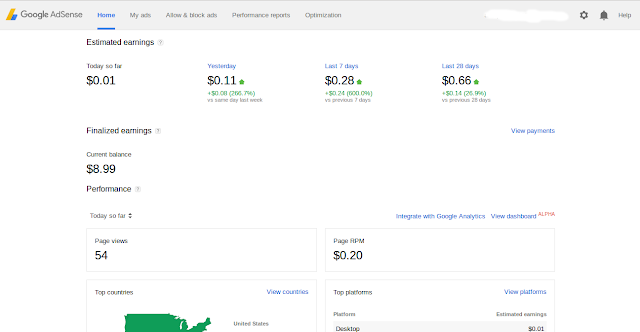 As you know after making a google adsense account, we forget to focus on the rules of the google adsense and start to use google adsense but we should know google adsense update its rules everytime. So, we only focus on the reason of why google adsense block our account. People post question like this. why my google Adsense account is blocked even though, i don't use ads in my website. please help. here we give some solution to protect your daily income. Click on your own ads :- usually people think it doesn't matter if they click on there website ads but google is smart. google know from where these clicks are coming. I think this is right time to give a good strong shot to this field with full of energy and enthusiasm this is my earning till 1 Aug 2016. I know it will increase in coming time so stay tune and guyz let me know how much you are earning.